The Michael Kors MK3311 for Women is the picture of glamour; it’s what every girl deserves. This watch features an intricate design and is studded with glittering stones that make for the ultimate eye grabber. Wear this watch with a simple full color dress and make a strong style statement that will get heads turning. This watch makes for a perfect gift to a loved one and looks resplendent in shiny silver. Go for a sophisticated and opulent look that will be the star of the night. The watch is adorned with dazzling pavé stones set upon a sleek silver backdrop. The band itself is ornate, with sparkling jewels lining the sides. These white stones look fabulous and are repeated in the round bezel as well as the dial. The dial is white in color and adds to the classy elegance of this watch. The watch is made of the finest materials the makers could get their hands on. This results in a watch that is breathtakingly beautiful. 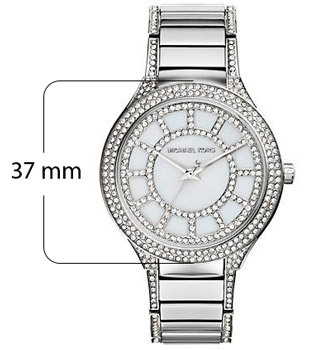 The Michael Kors MK3311 for Women features a polished silver stainless steel band that is lined on either side with glittering pavé stones. The watch is not only easy on the eyes but also quite sturdy. It possesses a water resistance of up to 5 ATM and enables you take it for a shower or even when chilling with some pals in the pool. The Michael Kors MK3311 for Women features a smart and reliable analog movement that gives you the accurate readings of the time.The Michael Kors MK3311 for Women is the picture of glamour; it’s what every girl deserves. This watch features an intricate design and is studded with glittering stones that make for the ultimate eye grabber. Wear this watch with a simple full color dress and make a strong style statement that will get heads turning. This watch makes for a perfect gift to a loved one and looks resplendent in shiny silver. Go for a sophisticated and opulent look that will be the star of the night. The watch is adorned with dazzling pavé stones set upon a sleek silver backdrop. The band itself is ornate, with sparkling jewels lining the sides. These white stones look fabulous and are repeated in the round bezel as well as the dial. The dial is white in color and adds to the classy elegance of this watch.